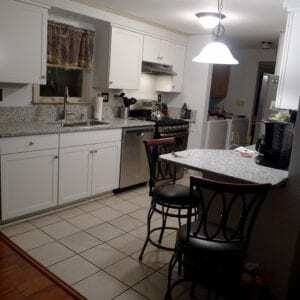 So rather than embark on a do-it-yourself process which we typically do, we decided to find a contractor to help with the cabinets and the counters. We were hoping that would be quicker than doing it ourselves. And to be honest, thinking of not having the full use of my kitchen for an extended period of time made me a bit cranky. So a speedy upgrade was the goal! Now the work is complete and the verdict is in. We are very happy with both companies we used and wanted to give them both a public shout-out! First, Greg at Premier Hammerhead Carpentry helped with the ordering and then did the installation of our cabinets. He was amazing. Not only was he punctual, helpful and quick getting us on his calendar, he was extremely precise with his work. He, and his helper, did the work over a two-day period. Our job was to remove all the items from the shelves and drawers before they came. Once they arrived, they went to work, removing only the cabinets they were working on at the moment. At the end of the first day, all of the top cabinets on both sides of the kitchen were replaced. We were left that day with the ability to use everything, just as we normally would. The second day, they came and replaced all the lower cabinets. Greg made sure our countertops would be easy to remove, because he knew they would be replaced. So the work took two days, and with the exception of the time that they were there working, I had full use of the kitchen. Phew! Then we focused on the countertops. We decided to go with granite, and after some not-so-impressive responses from some major home improvement stores, we stopped by the New York Granite Corporation in New Windsor, NY. Again, we are totally happy with the service and product we received. We stopped by late one week to select our counters. The following Monday two installers came and prepared a template for the counters. In order for them to do so, we had to remove our counters, which Greg at Premier Hammerhead had made simple for us. We took the counters off, the installers prepared their template. We put the counters back on and had a fully functioning kitchen again. A week later we received a call that the counters were in, and two days later the installers were at our home with the countertops. Again, we removed the old counters. They came in with the new ones and in a matter of 45 minutes, had the new counters and new sink installed, holes drilled for the kitchen faucet, everything was polished up, all their equipment was back in the truck, and they were out the driveway. 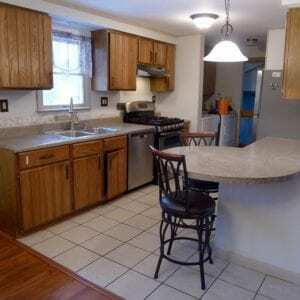 If you live in Orange County NY and need any cabinet or counter work, I would definitely recommend both Greg of Premier Hammerhead (845-978-3653), and New York Granite ( 845-563-0513). They were both great choices!